Sozomenus de Pistoia, Chronica, ab origine mundi ad annum 1292. 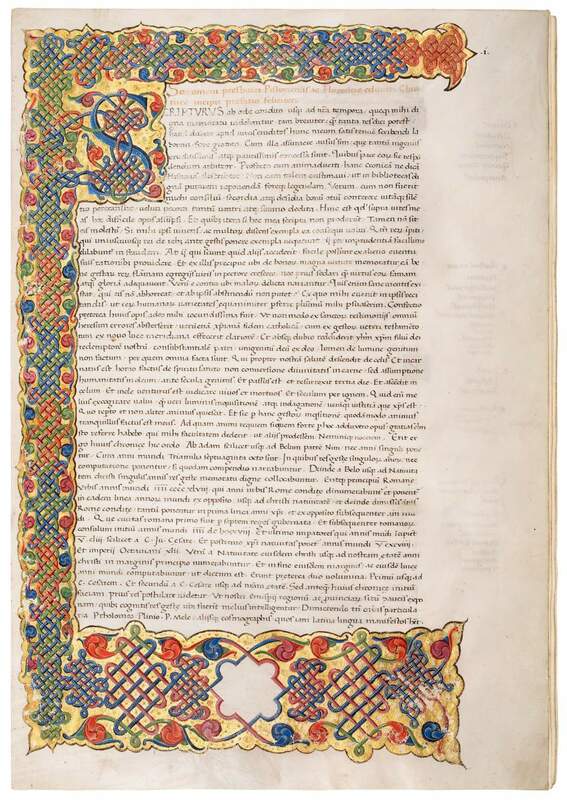 Sozomeno's magnificent world chronicle in a two-volume Renaissance manuscript, written by Filippo de Nanni de’Batini and a second, unknown scribe. These two grand, sumptuous volumes contain a world chronicle in the true medieval sense of a year-by-year description of events in various parts of the known world. The author treats biblical events and Greek, Roman, Islamic, Byzantine, and western history until the end of the 13th century. Sozomeno da Pistoia (1378-1458) was a humanist of wide culture who contributed to the history of classical studies and humanistic reforms of Renaissance Italy. He had studied at Padua and became interested in Greek at an early age. He also began copying manuscripts himself, learning the humanistic script in Florence. He took part in the Council of Constance (1417-1418), where he shared in Poggio Bracciolini’s discovery of Latin texts in the library of the nearby monastery of St. Gall. An esteemed professor, he lived in Florence for many years. He donated his great library to public use, entrusting the city of Pistoia with the obligation to make its works accessible. The present volumes open with beautiful title page decoration: volume I is decorated in the strap-work style of Ferrara, while volume II is decorated with a full border in the Florentine vine-stem style by the workshop of Francesco d’Antonio del Chierico. For the decoration to have been added in two different cities is not surprising given the circumstances in which the original text was copied, as only one volume could be copied per year.